Back to Off Topic index page. 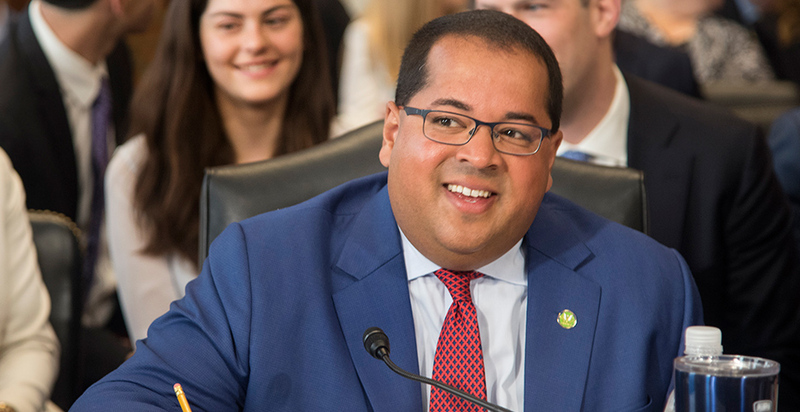 Neil Chatterjee doesn't like it when people refer to him as Senate Majority Leader Mitch McConnell's "coal guy" on the Federal Energy Regulatory Commission. While he's a Republican appointee from McConnell's home state, Kentucky, Chatterjee says his record on the commission shows he's no one-trick pony. "Since I've come to the commission, I've publicly come out and said that I believe climate change is occurring, that it's man-made and that we need to take aggressive steps to mitigate emissions," Chatterjee said in an interview last week from his office at FERC headquarters in Washington. Energy and environmental newsmakers dish on politics, pet peeves and their TV addictions. Click here to read more stories in this series. "While I'm proud of my roots in coal country, I think it's too simple to try and put me in that box," he said. A father of three who coaches soccer on weekends, Chatterjee, 40, learned politics in nearly a decade of working for the Republican senator, who's widely seen as a master of the craft and a champion of the coal industry. But Chatterjee says he takes his responsibilities as an independent regulator seriously, pointing to his vote last year to reject President Trump's proposed bailout of struggling coal and nuclear power plants. His votes are only going to become more important given the announced retirement of fellow Republican FERC Commissioner Robert Powelson. How do you pronounce your full first name? Indranil — In-dra-neel. I think it's a pretty common Indian name, but nobody could say it in kindergarten or preschool, so we truncated it. You grew up in Kentucky and met your wife there? We moved from New York to Kentucky when I was 14. Rebecca and I went to prom together. We were dating at the time. We got married at the end of law school, so we had been together for eight years. She has the real job: She stays home with the kids. Part of why I'm able to put in the hours and travel is largely is because she's the MVP. Why did you go into politics? My dad was really into politics, and when we would discuss politics, he sort of treated me different; he treated me like an adult. I remember being 10 years old and watching George Herbert Walker Bush debate Michael Dukakis. I didn't understand the policy nuances of what they were talking about, but I was into it and asking questions, and my dad was so excited I was so interested. My dad grew up in India, so a lot of the things I was interested in as a kid — sports, movies, video games — he just wasn't familiar with it. The fact that we had politics and policy was a thing we could both relate to. Was your father, Sunil, conservative? No, and that's another part of it. Maybe it's the contrarian in me or I just like to argue. My whole family, they still are pretty liberal Democrats, and I think maybe I just liked the back-and-forth. It was always civil; it never got hostile. We were never one of those families where someone got up and walked away from Thanksgiving dinner because they were mad about a fight. Do you still debate politics at the dinner table? Oh, my God, you should hear the conversation in the Chatterjee household. My sister gets in on the action. My mom is the most balanced, but even she'll dig in from time to time. When did you first meet McConnell? I first met him briefly as a kid. That came about after I had written a paper about the senator. Our teacher had asked us to research figures throughout history in Kentucky. He had just gotten re-elected; it was his second term in the Senate, and he was building his profile. I proudly told him I got a C on the paper. That's what my parents told me. Are you concerned about Powelson leaving? I'm bummed, because I like him personally. I've known him a long time. From a process standpoint, I think we have a good group of folks. We've been locking on pipelines; it's been 3-2. Everyone's quick to say, "They're going to go to 2-2." Well, Commissioner [Cheryl] LaFleur has been here for a long time, including serving as chair. If you look at her dissents of late, they're pretty narrow. I'm optimistic we'll be able to find ways to work together on these big challenges. Is there a timeline for replacing Powelson? Traditionally, a vacancy like that would linger for a while, but I actually think my colleagues in the Senate understand the significance the importance of this vacancy. I feel pretty confident that if they can identify a good person, they can move quickly. Republicans are traditionally pro-states' rights, but some critics say FERC in recent decisions has moved against state initiatives. How do you reconcile those two positions? This is a really, really tough one for me. What we have right now is a collision of two conservative philosophies, and I'm personally challenged by this. I'm a firm believer in states' rights, in local governments being able to make decisions about what their energy futures look like. But I also believe in markets, the efficiencies and values and benefits of markets. What you have now is a collision between states' rights and markets. What my colleagues and I are wrestling with is where to find that box to land this in. You have some who would argue for the supremacy of states' rights; you have others who say they're for states' rights, but when you join these organized markets, you see that autonomy. It's not an easy question. It's messy, but it's a real issue and one that's been building for some time. FERC should have been doing this for the past eight or 10 years, and it's unfortunate it's falling to us. Do you regret calling out actor James Cromwell in a Facebook post after he protested at FERC? I don't regret it. Look, I very much appreciate the passion with which protesters are participating in our process, and I sympathize with the frustration. I thought it was surreal — an actor whose performances in a couple movies I loved was at the commission, pointing his finger at me. I just saw him in "Jurassic World" this weekend. He was awesome. I was making light of the circumstance; I was trying to be funny. I wasn't trying to be mean or nasty. I regret that people interpreted it as me being nasty; I genuinely was trying to make light of what any person would have thought was a surreal situation. I have three years left in my term. I'm just now getting comfortable with the role. This is really rich, complicated material. I can't fathom what the future will hold. Would you ever run for Congress? Look, it's human nature when you work in an organization, if you're an ambitious person, you want to be head of the organization. I happen to have spent the past decade of my career where there's an elected person at the head of the organization, so of course it crosses your mind. But having seen the pros and cons of the legislative process, now having an opportunity to serve at a commission like this, the decisions we make are really critical to the future of the country.